Missouri State University (MSU or MO State), formerly Southwest Missouri State University, is a public university located in Springfield, Missouri, United States. Founded in 1905 as the Fourth District Normal School, it is the state's second largest university, with an official enrollment of 22,385 in the fall 2014 semester. In 2011, students represented 50 states, the District of Columbia, the Virgin Islands, and 83 countries. The Springfield campus is one of two degree-granting institutions within the Missouri State University System, the other being a two-year campus in West Plains, Missouri. A bachelor of science in business from MSU is offered at the Missouri State University Branch Campus Dalian in the People's Republic of China. In addition to its main campus, MSU maintains a fruit research station in Mountain Grove and the Department of Defense and Strategic Studies program housed in Fairfax, Virginia. The school is classified by the Carnegie Classification of Institutions of Higher Education as one of six master's colleges and universities in Missouri. In the 2014 U.S. News and World Report, the school was ranked 68th in the category Midwestern regional universities. Missouri State University was formed as the Fourth District Normal School, by legislative action on March 17, 1905. Like other normal schools of the day, the school's primary purpose was the preparation of teachers for the public school system. The university was officially founded on June 11, 1906 with the first class totaling 543 students in an off-campus facility. The first permanent campus building was Academic Hall. Its cornerstone was laid on August 10, 1907 and construction was completed in January 1909. The building is now known as Carrington Hall, named after William T. Carrington, the first president of the State Normal School. It serves as the University's administrative center. The Fourth District Normal School became Southwest Missouri State Teacher's College in 1919 to reflect its regional and academic emphasis. Throughout the interwar period, the College's programs expanded to include liberal arts and sciences in the curriculum, thus facilitating a name change to Southwest Missouri State College in 1945. A burgeoning student population throughout the 1950s and 1960s resulted in the establishment of residence halls, accompanied by a growth in post-graduate studies. This led to a third name change in 1972, to Southwest Missouri State University. In 1973, enrollment surpassed 10,000 students for the first time. By 1985, SMSU had grown into the second-largest public university in the state, leading administrators to support a bill to change the name to Missouri State University, which eventually died in committee in the Missouri General Assembly. In 1990, enrollment surpassed 20,000 students for the first time, but further attempts to rename the school throughout the 1990s and early 2000s also failed. However, the state legislature did grant the university a statewide mission in Public Affairs in 1995. In 2004, with the election of Springfield native Matt Blunt to the governorship and the approaching centennial of the university's founding, new support developed for the name change. It was opposed by the University of Missouri System (which operates the four campuses of the University of Missouri), which feared that the name change would lead to duplication of academic programs and ongoing battles for students and state funding. In 2005 the name-change bill was passed, following a late-night compromise between University of Missouri System President Elson Floyd and then-Southwest Missouri State President John Keiser, stating that Missouri State University would not duplicate certain professional programs offered by the University of Missouri. The bill to rename the University finally passed the Missouri Senate (25–7). On March 1, 2005, after more than seven hours of debate, the bill passed the Missouri House (120–35). Governor Blunt signed it into law on March 17, 2005—the centennial anniversary of the University—at the Plaster Student Union where several student leaders and state leaders were present. The University offers more than 150 undergraduate majors and over 45 graduate programs. 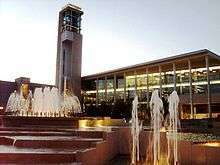 For the 2009 fiscal year the University awarded 4,093 degrees. The Springfield campus had 721 full-time instructional faculty in fall 2009, of which 46 percent were female and 60 percent were tenured. The student-faculty ration is 20-to-1. Nearly 90 percent of full-time ranked faculty members have the most advanced degree available in their field. During its 2009 fiscal year, MSU received 196 grants totalling $20,901,035. Freshmen entering for the fall 2010 semester had an average ACT score of 24.1 (well above both the state and national averages) and a high school grade point average of 3.60. The MSU College of Business is the largest college of business in Missouri and one of the largest in the Midwest. Missouri State’s COB is housed in David D. Glass Hall, a 4 story, 185,000-square-foot (17,200 m2) state-of-the-art building. Glass Hall is named in honor of MSU alumnus and former Wal-Mart CEO David Glass. Not only has the COB received the highest level of accreditation available, but all programs in the College of Business are fully accredited by the Association to Advance Collegiate Schools of Business (AACSB). Among colleges and universities in the nation offering business degrees, only 10 percent have been granted this status. The College of Business underwent a major renovation in 2016 to update the building and provide more space for academic activities. MSU reported the typical annual cost of attendance for the 2012-13 academic year as $14,996 for Missouri residents and $21,342 for non-residents. This included tuition and required student fees of $6,792 for residents and $13,138 for non-residents, $7,204 for room and board, and $1,000 estimated for books and supplies. These costs reflected action taken on March 30, 2012, by the MSU Board of Governors to increase tuition by approximately 3% ($6.48 per credit hour) for in-state undergraduates. Out-of-state undergraduate tuition was also increased by $24 per credit hour, and a $25-per-credit-hour fee for upper-level courses in the business school was initiated. In June 2000, Missouri State University entered into an agreement with Liaoning Normal University of the People's Republic of China to establish the Missouri State Branch Campus Dailan (LNU-MSU College of International Business) on the campus of LNU. As an educational cooperation project between the two universities, the Branch Campus received formal approval from the governing bodies of both universities, the Missouri State Board of Governors and the Bureau of Education of Liaoning Province, China. Missouri State University has a statewide mission in public affairs granted by the state legislature in 1995. The mission is stated as having three broad themes: Ethical Leadership, Cultural Competence and Community Engagement. The goal of the Ethical Leadership component has been articulated by MSU as "students will articulate their value systems, act ethically within the context of a democratic society, and demonstrate engaged and principled leadership." The stated objective of the Cultural Competence component is "students will recognize and respect multiple perspectives and cultures." Two goals have been articulated for the Community Engagement portion of the mission. They are that "students will recognize the importance of contributing their knowledge and experiences to their own community and the broader society" and "students will recognize the importance of scientific principles in the generation of sound public policy." The public affairs mission is emphasized and enhanced by designated Public Affairs Professorships and a Provost Fellow for Public Affairs, special scholarship programs, grant program, Excellence in Community Service Awards, a yearly week-long Missouri Public Affairs Academy for high school students, a campus-wide public affairs emphasis week and the annual MSU Public Affairs Conference which brings together a diverse group of speakers and panelist for public discussions of various aspects of the public affairs mission. Past conference speakers have included Robert F. Kennedy, Jr., Nawal El Saadawi, Les Garland, John Edwards and Frances Hesselbein. Students at Missouri State University have the opportunity to spend as little as a week or as much as an entire academic year studying abroad while receiving academic credit. The Study Away Programs Office, located in the Jim D. Morris Center, has partnerships with several program providers and direct exchange agreements that allow students to go more or less anywhere in the world. Students at Missouri State University are encouraged to learn more about Study Away opportunities by dropping by the Study Away Office, checking out the Study Away webpage, or attending a Study Away 101 Information Session. Missouri State University’s main campus, containing over 40 buildings, is located on 225 acres (91.1 ha) in central Springfield. National Avenue forms the eastern boundary, with South Holland and Kimbrough Avenues to the west, Cherry and Elm Streets to the north, and Grand Street to the south. John Q. Hammons Parkway bisects the campus, running north and south. The campus contains a variety of architectural styles, with the oldest buildings exhibiting a Neoclassical style and newer buildings displaying a mix of Modern styles including International, Brutalist, Bauhaus and High-tech, unified through the use of light-colored stone and concrete exterior materials. Facing National Avenue is the "Historic Quadrangle," containing Carrington Hall (1908), Hill Hall (1923) and Siceluff Hall (1927), as well as Cheek Hall (1955) and Ellis Hall (1959). South of that area is Pummill Hall (1957), Karls Hall (1958) and Craig Hall (1967), which contains the Coger Theater and is the site of an annual outdoor summer tent theatre program. In the center of campus is the Duane G. Meyer Library, constructed in 1980 and named after a former president of the University. It contains over 877,000 books, subscriptions to over 3,500 periodicals and newspapers with back issues on microfilm, microfiche, and microcard, and full text electronic access to over 20,000 periodicals. In addition, the library contains over 934,000 state, federal and United Nations government documents. The Meyer Library was renovated and expanded in 2002, and included the addition of the Jane A. Meyer Carillon, one of only 164 such instruments in the United States. In front of Meyer Library is the five-level, multi-jet John Q. Hammons Fountain (named for the MSU alumnus and hotel developer). Other major academic buildings are located south and west of the Meyer Library. These include Temple Hall (1971), Kemper Hall (1976), Glass Hall (1988) and Strong Hall (1998). The majority of the north side of the campus is dedicated to student residences and recreational areas; however, Greenwood Laboratory School, a fully functioning K-12 school, is also located in this area. The Jane A. Meyer Carillon is located in the center of the Missouri State University campus, at the southeast corner of the Duane G. Meyer Library. At 140 feet (43 m) tall, it is the tallest carillon in the Midwestern United States and serves as a campus icon and focal point. It was dedicated on April 13, 2002. The total weight of the 48 bronze bells and cast-iron clappers is 32,000 pounds, with the largest bell weighing 5,894 pounds, or nearly three tons. The complete carillon and its supporting tower structure weighs 2.5 million pounds. Funds for the purchase of the bells and keyboard and for the construction of the tower were provided by Ken and Jane Meyer, longtime friends of the University and supporters of the arts. Jane Meyer was a former organ student of the MSU Department of Music. The carillon’s 48 bronze bells, cast-iron clappers and keyboard were purchased from and installed by Royal Eijsbouts, a prestigious bell making firm from the Netherlands. The carillon plays the standard Westminster chime sequence every 15 minutes, with the first of the hourly bells marking the exact start of each hour. The department of music also coordinates and presents special concerts throughout the year. Juanita K. Hammons Hall for the Performing Arts is a 2,220-seat center located in the northwest corner of the campus. Juanita K. (as referred to by locals) not only hosts the University's music, dance and theatre department performances, it is home to the Springfield Symphony Orchestra. 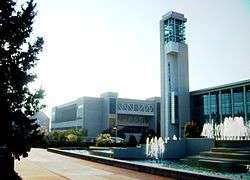 It is the Springfield area’s major performance hall and presents a regular schedule of national touring companies and prominent individual performers. The hall includes multi-level boxes and moveable orchestra pit; spacious backstage facilities with individual, crew and chorus dressing rooms, cast lounge, green room, loading dock and break areas; an expansive multi-level lobby; public and private reception areas; full-service front-of-house, technical and support staff offices; an on-site computerized box office; and a 5-level parking garage adjacent to the building. Southeast of Meyer Library is the Robert W. Plaster Sports Complex. Originally built in 1930, the athletic field became the stadium in 1941 and was known for many years as Briggs Stadium in honor of Coach A. W. Briggs, longtime head of Missouri State's athletic department. In 2014, the stadium was converted to a football-specific field surface and other renovations were made for a more intimate fan experience. The playing surface was replaced and moved closer to the west grand stand. In addition, the student side (east side) was fully replaced from the ground up and includes game day locker rooms, a new scoreboard and a party platform called "The Clif". The facility was renamed after a major expansion and renovation in the 1980s that included installation of an artificial playing surface, an all-weather track, a second level of seating, twelve racquetball courts, men's and women's locker rooms, five classrooms, and a fitness center. Immediately north of Plaster Sports Complex is McDonald Arena, built by WPA labor in 1940. 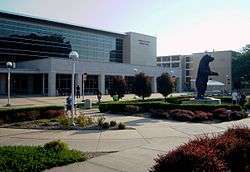 It served as the university's central indoor arena until construction of the John Q. Hammons Student Center on the campus' north-west edge in 1976. That venue was in turn replaced as the primary indoor sporting venue by construction of the adjacent 11,000-seat JQH Arena in 2008. IDEA Commons (short for Innovation, Design, Entrepreneurship, and Art) is an urban research park in Downtown Springfield that blends together residential, retail and entertainment facilities supported by various university programs. Currently the Jordan Valley Innovation Center (JVIC) and "Brick City" are located within the IDEA Commons. The JVIC is a Missouri State University research center providing "hands-on" learning and experience for students, as well as support and business opportunities for affiliated businesses. Within the JVIC are three operating units: The Center for Applied Science and Engineering (CASE), The Center for Biomedical and Life Sciences (CBLS), and Springfield Innovation, Inc. (SI2). The JVIC is located in the former Missouri Farmers Association milling facility. Brick City, located at 305 West Mill Street, was renovated for the Fall 2008 semester to house several elements of the MSU Art and Design department. Missouri State University won the University Economic Development Association’s (UEDA) 2009 Award of Excellence for their work on IDEA Commons at the UEDA annual symposium. MSU’s IDEA Commons beat 34 other institutions, including two other finalists, North Carolina State University and the University of Memphis, for the award. The Darr Agricultural Center is located on 90 acres (36.4 ha) near the intersection of Kansas Expressway and Sunshine Street in southwest Springfield. The Darr Center serves as a laboratory and field experience classroom for the study of livestock management, equine studies, horticulture, agronomy, animal science, and wildlife conservation and management. Improvements in 2007 included extensive renovation of the main arena, as well as the addition of a stalling barn, a multi-use barn, office space, bovine and equine handling facilities, a research laboratory, a classroom, and a two-bedroom apartment for graduate student housing. In 2010 MSU announced a $6.5 Million expansion of the facility to include construction of a new Learning Center with a large classroom and lecture hall equipped with an animal entrance and specialized pen; classrooms with distance learning technology; and laboratories to facilitate research in the areas of water quality, soil chemistry, horticultural sciences, animal physiology and more. The building will also include a conference space and a 400-person capacity banquet hall available for public and private events. The new facility is to be LEED Silver certified, incorporating sustainability features such as site filtering of storm water runoff, occupancy sensors that control lighting and temperature, use of natural light, and ground source heat-pump systems. OurPromise is Missouri State University’s newest capital campaign. The goal is to raise a total of $125 million allocated as $20 million for student scholarships, $15 million for faculty endowments, $40 million for enhancement for programs/community engagement, $1.5 million investment in the West Plains campus, and $48.5 million for facilities. Facility enhancements include improvement and expansion of the Darr Agricultural Center, a 90-acre (36.4 ha) hands-on learning center five miles (8 km) from the main Springfield campus; construction of a new 100,000 sq ft (9,300 m2). student recreation center; further development of the IDEA Commons; additions to the Greenwood Laboratory School and enhancement of the Roy Blunt Jordan Valley Innovation Center. The money will also help pay off bonds spent on the 11,000-seat JQH Arena. 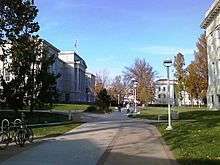 The Missouri State University main campus contains nine residence halls. Wells House, the first campus residence hall, houses 490 men and women. Freudenberger House (referred to by students as "Freddy") is a five-story, U-shaped residence hall, designed with 2-, 3- and 4-person rooms to accommodate 740 men and women on single-gender floors. Woods House provides 376 men and women with accommodations on single-gender floors and features a 10th floor common area with sweeping views of the surrounding area. Blair-Shannon House accommodates 729 men and women in a suite-style format with the living areas on single-gender floors. Hammons House is an eight-story residence hall that accommodates 584 men and women on single-gender floors. A twin residence hall of Hammons House, Hutchens House is an eight-story residence hall offering housing accommodations for 605 men and women on five mixed-gender floors. Scholars House provides lodging for 115 students who are Honors Program participants or Presidential Scholarship recipients. Kentwood Hall, originally built as the luxury Kentwood Arms Hotel (1926) and whose guests included President Harry S. Truman and comedian Groucho Marx, accommodates 136 upper-class men and women and non-traditional students in a co-ed environment. 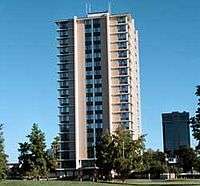 Sunvilla Tower is an 18-story apartment facility that houses 186 upper-class men and women in a coed environment. Computer labs, fitness rooms, laundry rooms, music practice rooms, kitchen facilities, and public meeting or study spaces are located in each residence. Available services include free laundry, free cable TV, WI-FI in public areas (full wireless access in Woods and Scholars Houses) and 24-hour front desk assistance. Within select houses are floors designated as "Living-learning Communities" (LLCs). These have a particular theme such as first-year experience, sophomore experience, or College of Health and Human Services majors. Certain floors are also designated as "quiet living environments." All residential areas are smoke and tobacco free. MSU provides three on-campus dining centers offering an all-you-can-eat cafeteria format. The oldest and busiest is Blair-Shannon Dining Hall (located on the first floor of Blair-Shannon House) which employs a staff of 60 and serves over 19,000 meals per week during the fall and spring semesters. Garst Dining Center is located between Hammons House and Hutchens House. Along with traditional fare and hours, Garst also offers "after hours" dining with a reduced menu from 9:00–11:00PM during the fall semester. After hours dining switches to Blair-Shannon for the second half of the year. Kentwood Dining Center is located in the historic Kentwood Hall. Smallest of the on-campus dining centers, Kentwood was remodeled in 2002, and provides a more traditional atmosphere, with exposed brick walls and an open fireplace. A number of other dining options are also available on the MSU campus. Table service dining is provided at the Union Club located on the Fourth Floor of the Plaster Student Union. The Union Club is open to all students, staff, faculty, and friends of the Missouri State campus for lunch only. Also located in the Plaster Student Union is Chick-Fil-A; Panda Express, Subway Subs and Salads; Papa John's Pizza; Red Mango, featuring fresh fruit smoothies and yogurt; and Starbucks, located downstairs. Boomer's Café and a convenience store are located on the first floor of Hammons House. Boomer's (named for MSU's bear mascot) provides a menu of hot breakfast items, hamburgers, salads, sandwiches and Mexican food, as well as Starbucks coffee. Starbucks is also offered, along with grab-and-go items, at Cafe a la Cart on the first floor of Strong Hall. Most of the campus dining venues are managed and operated by Missouri State Dining Services in Partnership with Chartwells. Plaster Student Union with the MSU bear mascot statue in front. Freudenberger House is to the right of the PSU. The four-story Robert W. Plaster Student Union (PSU), is located in the center of campus between the main academic and residential areas. This building provides a place for students to dine, socialize, study, shop, and see films and guest speakers in the theater. It also houses a bank, convenience store, copy shop, ticket outlet, and video game/media store. A variety of meeting rooms are located in the PSU and over 15,000 meetings are hosted there each year. Offices located in the Plaster Student Union include Student Engagement, Student Conduct, Multicultural Resources, Zip Card, Campus Recreation, Outdoor Adventures, Sodexo Campus Services, Citizenship and Service-Learning, Conference Services, various Student Organizations, the Dean of Students, Judicial Affairs, Disability Support Services, and Student Orientation, Advisement & Registration (SOAR). The PSU also includes the Leland E. Traywick Parliamentary Room. Dedicated on February 18, 2004, it is named to honor a former MSU president and his introduction of shared governance, including the establishment of the Faculty Senate, during his presidency. A bronze bear statue was dedicated to the University in 1999 and stands at the front entrance of the student union. Also located in front of the PSU is the North Mall, location of the "Bear Paw." The Bear Paw is an outdoor plaza and performance area constructed for concerts, forums, rallies, demonstrations, and other similar public activities. Any member of the university community (students, faculty, staff) may reserve the Bear Paw, and when not reserved it is available for expressive activities on a first come, first served basis. The Level One Game Center, located in the Plaster Student Union, offers eight bowling alleys, billiards and table tennis. An active Intramural sports program includes competition in basketball, billiards, bowling, disc golf, dodgeball, flag football, futsal, golf, racquetball, sand volleyball, soccer, softball, table tennis, tennis, track, ultimate, volleyball and weight lifting. Two large intramural fields with artificial turf, electronic scoreboards and stadium lighting are located on East Harrison Street near Scholars House. A Fitness and Wellness Program offers a variety of group classes and activities to students, including classes with licensed instructors in Pilates, Yoga, Belly Dance and Zumba. The campus Outdoor Adventures program also provides opportunity and equipment rentals for activities such as rock climbing, caving, camping, canoeing and kayaking in the surrounding Ozark Mountains. In 2012, two years after breaking ground, the 100,000 sq ft (9,300 m2) Bill R. Foster and Family Recreation Center was opened. The center features an indoor jogging track (6.5 laps = 1 mile), multipurpose rooms, locker rooms, a sauna, basketball courts, an expansive fitness center, rock climbing and bouldering walls, multi-purpose activity courts, lounge areas with computer stations and flat panel TVs, a wellness center, and a 7,000 sq ft (650 m2) recreational pool with 3 lap lanes, underwater bench seating w/ 12 hydrotherapy back jets, lighted spray features, ramp and stair entry, water current channel for water walking & therapy, open water area for basketball, volleyball and Hydro-Power classes, a zip-line, and a spa. There are over 300 student organizations at Missouri State. Student organizations are grouped into eight categories according to their main purpose. These include Academic/Professional, Greek, Honorary, Religious, Service, Social, Sports, and University. The Student Government Association (SGA) is the official voice of the student body at Missouri State University. SGA strives to find solutions to campus issues by making policy recommendations to the administration. SGA is a forum for problems, concerns, questions, suggestions, and ideas as they relate to student life on campus. SGA serves as the governing body for all students and student organizations on campus. SGA was established in 1921 and has been active on campus ever since. There have been 88 presidents elected as of 2009. SGA is entirely funded by student fees. Meetings are held each Tuesday at 5:30PM and are open to the public. The Student Activities Council (SAC) is a student-run programming board dedicated to enhancing the college experience at Missouri State. SAC orchestrates activities and programs in the Plaster Student Union and around the campus. By effectively utilizing the Student Involvement Fee, SAC aims to provide educational, entertaining, cultural, and leisure opportunities to complement the students' academic experience. The Policy debate program (Holt V. Spicer Debate Forum) began one year after the university's founding, and Craig Hall is named for the first coach (Virginia Craig). The program participates in National Debate Tournament & Cross Examination Debate Association, competing head to head at tournaments against major universities such as Harvard, Dartmouth, Northwestern, USC, Emory, and the University of Michigan. The program has several historical and recent successes, reaching the final four in the NDT twice (1973, 2008) and the final four in CEDA five times (1988, 1990, 1991, 1992, 2008), including its 1992 CEDA National Championship. The Pride Band is the university's marching band. The Pride consists of 300 student musicians. The band plays at every home football game and has been featured in the Macy's Thanksgiving Day Parade in New York City (1988, 1996, 2001), the Tournament of Roses Parade in Pasadena (1995 and 2008), and the Orange Bowl Parade in Miami (1988). They have appeared in the Louisiana Superdome for the New Orleans Saints, in the Trans World Dome for the St. Louis Rams, at Arrowhead Stadium for the Kansas City Chiefs, and at Mile High Stadium for the Denver Broncos. In December 2005 the Pride Band traveled to London, England to be the honor band in the London New Year's Day parade, and was the Honor Band in the 2009 McDonald's Thanksgiving Parade in Chicago, Illinois. The MSU Army ROTC program was established in 1952. Since 1970, MSU has been the headquarters of the ROTC "Bear Battalion" in partnership with six other Springfield-area colleges (Evangel University, College of the Ozarks, Southwest Baptist University, Drury University, Baptist Bible College and Central Bible College). As of July 2008, the Bear Battalion had commissioned 1,721 Army officers including ten General Officers: LTG Neal T. Jaco, LTG John E. Miller, MG Fred F. Marty, MG Robert L. Gordon, MG Robert F. Pennycuick, MG David E. White, MG Jarrett J. Robertson, BG William A. West, BG Tony L. Stansberry and BG J. Marty Robinson. "The Standard" is the university's student-run newspaper. It is published every Tuesday during the fall and spring semesters. The newspaper's content is entirely created and edited by the student staff. "The Underground" is an unofficial student publication serving Missouri State University. It is produced by a staff of student volunteers and publishes twice-a-month. "Ozarks News Journal" is a half-hour Public Affairs TV News Magazine produced fall and spring semesters by broadcast journalism students in the Media, Journalism & Film Department. The show airs weekly on Media Com cable 22 in Springfield. "KSMU" 91.1 FM is the university's licensed public radio station, broadcasting National Public Radio content, local news and classical music. Its state-of-the-art studios are located in Strong Hall. The station has received numerous awards, including the 2002 National Edward R. Murrow Award from the RTNDA for News Series, the 2001 Regional Edward R. Murrow Award from the RTNDA for Feature Reporting, the 1987 National Edward R. Murrow Award from the RTNDA for Investigative Reporting, The Missouri Broadcasters Association Excellence Award in Documentary Public Affairs in 2002 and 2000, Certificates of Merit for Feature Reporting, Public Affairs Reporting, and Complete News from the Missouri Broadcasters Association, three Public Radio News Directors Incorporated Awards, and the Missouri State Teachers Association Award for Excellence in Education Reporting. MSU is also the licensee operating Ozark Public Television, providing PBS programming and instructional television services to 549,540 households in Southwest Missouri and the adjoining three state area. KOZK, the PBS member station in Springfield airs on digital channel 23, virtual channel 21, and a sister station, KOZJ, airs in Joplin, Missouri as digital channel 25, virtual channel 26. The stations digital signal multicasts as 21.1/26.1: OPT-High Definition; 21.2/26.2: OPT-ED (Airs telecourses from MSU as well as miscellaneous PBS programming); and 21.3/26.3: Create, a how-to/DIY network. The broadcast and studio facilities are located in Strong Hall. National Panhellenic Conference member organizations at MSU include: Alpha Chi Omega, Alpha Delta Pi, Alpha Sigma Alpha, Delta Zeta, Gamma Phi Beta, Sigma Kappa and Sigma Sigma Sigma. National Pan-Hellenic Council members include: Alpha Phi Alpha, Delta Sigma Theta, Kappa Alpha Psi, Omega Psi Phi, Phi Beta Sigma, and Zeta Phi Beta. Interfraternity Council members include: Alpha Gamma Sigma, Alpha Kappa Lambda, Delta Chi, Delta Sigma Phi, Kappa Alpha Order, Kappa Sigma, Omega Delta Phi, Phi Delta Theta, Phi Gamma Delta, Pi Kappa Alpha, Pi Kappa Phi, Sigma Nu, Sigma Pi, Sigma Chi, Sigma Phi Epsilon, Theta Chi, and Tau Kappa Epsilon. Additional independent Greek organizations include Sigma Alpha Chi, Phi Mu Alpha Sinfonia and Xi Omicron Iota. In October 2009, the Missouri State University Panhellenic received the Risk Management Award at the National Panhellenic Conference Annual Meeting. Missouri State University sponsors NCAA Division I inter-collegiate athletic teams in men's and women's basketball, golf, soccer, swimming and diving; men's baseball and football; and women's cross country, field hockey, softball, track, and volleyball. MSU teams are nicknamed the Bears, and team colors are maroon and white. The Missouri State University Bears are members of the Missouri Valley Conference for all sports except football (Missouri Valley Football Conference), men's swimming and diving (Mid-American Conference), and field hockey (Mid-American Conference). Football competes in the NCAA Division I Football Championship Subdivision. Missouri State teams have made 52 NCAA championship appearances since moving to Division I in the 1982–83 season. The men's basketball team reached the Sweet Sixteen in 1999, women's basketball made the Final Four in 1992 and 2001, baseball made the College World Series in 2003, and volleyball earned their 1000th win Nov. 17, 2006 (only the second team in NCAA history to do so). In 1974, the women's softball team won the AIAW national championship. Football, Soccer and Field Hockey games are played at Plaster Sports Complex. 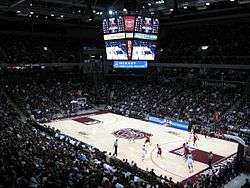 Men's and Women's Basketball games are played at JQH Arena, and Volleyball games, as well as Swimming and Diving competitions, are held at Hammons Student Center. Softball games are played at Killian Softball Stadium, which underwent a $2.7 million renovation in 2009. The Bears baseball team shares 7,986-seat Hammons Field, located a few blocks north of the MSU campus, with the Springfield Cardinals of the AA Texas League. Missouri State has remained steadfast in their approach to Conference Realignment. There are plans in the works to improve Plaster Sports Complex, which include the removal of the track. 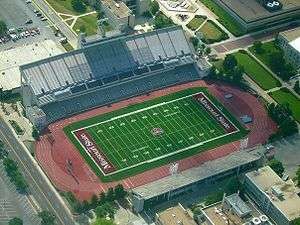 Missouri State is exploring options of building an on-campus soccer and track-and-field on-campus stadium as well as a future Field Hockey on-campus stadium. Athletics Director Kyle Moats has told reporters that "Missouri State is not actively seeking new conference membership, but is keeping their options open." During the 2011 Football Season, a Missouri State athlete tweeted that the school had received an invitation to Conference USA, but later it was denied by Kyle Moats. Missouri State University also sponsors several strong club teams. The MSU Handball team has won the National Collegiate Handball Team Championship 10 times, including seven years straight (1993, 1994, 1995, 1996, 1997, 1998, 1999, 2004, 2006 and 2008). MSU handball players have also captured the individual women's title nine times and the men's title six times. The team was founded in 1988 and is under the leadership of coach Tommy Burnett. In 2001, Missouri State started a club Ice Hockey team, Missouri State University Ice Bears Hockey, that competes in the American Collegiate Hockey Association (ACHA) Division I Western Collegiate Hockey Association. In 2009 the Ice Bears made their fourth straight ACHA Central Region post season tournament appearance. In 2014, the Missouri State University Ice Bears won the Central Division Regionals and made their first ACHA National Championship Appearance in their 13-year existence. In 2015 the Ice Bears made their second consecutive National Championship Tournament appearance in Salt Lake City Utah. After a 30-2 vote the Ice Bears joined the WCHL in ACHA Division 1 for the 2015-16 season. Ice Bears home games are played at Mediacom Ice Park. Missouri State also has a club Lacrosse team, founded in 2003, that competes in the Men's Collegiate Lacrosse Association (MCLA) Division II in the Great Rivers Lacrosse Conference (GRLC). In 2009 and 2010, the Bears received an automatic qualifier for the MCLA National Championships in Denver, Colorado, after winning the GRLC championship. Since 2003, MSU lacrosse has fielded 5 All-Americans, 41 All-Conference players, 2 GRLC Tournament MVP's, and 2 GRLC Division II Coach of the Year Awards. Additional club sports at Missouri State include a bowling team, pistol team, rodeo team, roller hockey club, water ski team and wrestling club. "The Scotsman" was officially adopted as the university's fight song in the 1960s. The Fight Song is sung after every home football touchdown. The traditional alumni song of Missouri State is performed at every commencement ceremony and sometimes played at athletic events or other ceremonies. The traditions of school colors and the school mascot were established during the 1906 school year, before the first permanent building (Carrington Hall) was even constructed. A joint committee of faculty and students decided on the colors of maroon and white to represent the University. The same committee also selected the Bear as the official school mascot, basing their choice on the design of the state seal of Missouri. The colors and mascots are reflected on the school seal. Chinese MBA program: In 2011 the university's executive M.B.A.program for students from China came under scrutiny after an article in the Springfield News-Leader questioned the financial relationship between Missouri State and its Hong Kong-based agent, alleging that students were paying double the amount that MSU was receiving. The executive M.B.A. program accepts cohorts of students who come through a sponsor: a provincial or municipal government agency, a university, or a corporation. Missouri State's agent, the International Management Education Corporation (IMEC), identifies and develops relationships with sponsors, who identify and prepare students, screening them for work experience, a minimum grade-point average at the undergraduate level (2.75) and English language proficiency. IMEC then provides MSU with a cohort of a minimum of 30 students, and the sponsors send MSU the students' applications for review. The fees students pay vary by sponsor and range from $15,000 to $22,000. IMEC was contracted to pay Missouri State between $10,103 and $11,886 per student; resulting in between 20 and 55 percent of the student fee being retained by IMEC. IMEC defended the fees claiming they cover marketing/promotion/recruiting and the related overhead costs as well as additional costs including intensive English training, exams, advice on applications and documentations, visa application fees and service and orientations provided by IMEC. University officials defended the program and arrangement stating that it had allowed Missouri State to quickly grow the executive M.B.A. program without having to spend university resources recruiting and marketing overseas. The program has had 370 students since it started in 2007. However, the chair of the Faculty Senate said professors have periodically raised questions about the quality and oversight of the various China initiatives, and had prepared a list of questions for the president in light of the article, expressing a desire to ensure that proper oversight was in place to avoid compromising quality. Following translation and re-publication of information from the News-Leader article by Chinese newspapers, MSU reported that it received calls from several program sponsor organizations in China that they would no longer participate in the program. The university continued to defend the program, arguing that mistranslations of the article had provided an incorrect view of the program's academic rigor and stating that it intended to meet with sponsors and answer any questions about the program. Non-discrimination on basis of sexual orientation: In 2006, the university modified its nondiscrimination policy to include sexual orientation as an officially protected status. The addition reads: "... the University does not discriminate on any basis (including, but not limited to, political affiliation and sexual orientation) not related to the applicable educational requirements for students or the applicable job requirements for employees." Former University president John Keiser had firmly opposed the change as did the Student Government Association during 2004 when Student Body President Chris Curtis moved to change the SGA constitution to mirror the university's. However, the policy was quietly changed on September 18, 2006 during a meeting held for the first time outside of Springfield in St. Louis. It is generally believed this move was to avoid the mostly conservative citizens of Springfield and add this policy "under the radar" of the critics of the change. Missouri Governor Matt Blunt quickly released criticism of the policy change calling it "unnecessary and bad;" also saying the decision "bows to the forces of political correctness". Grading policy: Missouri State University converted to a plus or minus grading system instead of the standard A, B, C, D and F system starting with the Fall 2009 term. Individual professors can decide whether to use this grading system in their classes. Under the new grading scale, a C− will not qualify as a passing grade for courses requiring a C or better. Tobacco-free campus: Citing the proven detrimental health effects of tobacco use, effective August 15, 2010, Missouri State University enacted a policy further restricting the use of tobacco products on the campus. Smoking is allowed only at designated smoking areas outside JQH Arena, Plaster Stadium, Hammons Student Center, and Juanita K. Hammons Hall during performances or events, and inside of private vehicles located on University parking lots. The use of smokeless tobacco is prohibited at all locations on campus. ↑ As of 2014 "NCSE Public Tables Endowment Market Values" (PDF). January 2015. Retrieved September 10, 2015. 1 2 "Missouri State Board extends contract with President Smart". August 1, 2014. Retrieved August 22, 2014. ↑ "Missouri State renews agreements with Einhellig, Bennett, Moats". April 14, 2014. Retrieved August 22, 2014. 1 2 "Archived copy" (PDF). Archived from the original (PDF) on September 7, 2015. Retrieved September 10, 2015. ↑ "Colors - Identity Standards - Missouri State University". Missouristate.edu. 2015-02-05. Retrieved 2016-04-05. ↑ "Missouri State University system sets another fall enrollment record". September 16, 2015. Retrieved September 16, 2015. ↑ Missouri State University System – Undergraduate Catalog – Missouri State University. Missouristate.edu. Retrieved on 2011-01-14. ↑ The Department of Defense and Strategic Studies in Washington D.C. Dss.missouristate.edu (2010-02-01). Retrieved on 2011-01-14. ↑ "College Navigator – Missouri State University". Retrieved 19 September 2014. ↑ "Regional University Midwest Rankings - Top Regional Universities Midwest - US News Best Colleges - page 6". Retrieved 19 September 2014. ↑ "History of the University – About Missouri State – Missouri State University". Retrieved 19 September 2014. ↑ "Presidential History - Office of the President - Missouri State University". Missouristate.edu. 2013-09-19. Retrieved 2013-11-10. ↑ "Missouri State Outreach - Missouri State University". Outreach.missouristate.edu. 2015-11-13. Retrieved 2016-04-05. ↑ "Missouri State Online - Missouri State Outreach - Missouri State University". Online.missouristate.edu. 2016-03-18. Retrieved 2016-04-05. ↑ DEGREES CONFERRED BY PUBLIC INSTITUTIONS, BY LEVEL, FY 2009, Missouri Department of Higher Education. Retrieved on 2011-03-02. 1 2 3 "About Missouri State – Missouri State University". Retrieved 19 September 2014. ↑ "Average ACT Scores by State". Retrieved 19 September 2014. ↑ "College of Business Administration - About COBA". MissouriState.edu. Retrieved 2011-06-10. ↑ "Facilities". Missouri State University web site. Retrieved 2009-11-19. ↑ "College of Business Administration – Missouri State University". Retrieved 19 September 2014. ↑ "Tuition, Costs and Fees - Missouri State University". Missouristate.edu. 2013-10-29. Retrieved 2013-11-10. ↑ "Tuition Going Up at Missouri State". Retrieved 19 September 2014. ↑ "Missouri State University-Branch Campus, China". Retrieved 19 September 2014. ↑ "A Statewide Mission for SMSU - Welcoming the 21st Century - Missouri State University". Missouristate.edu. Retrieved 2012-09-17. ↑ Public Affairs Mission – Public Affairs – Missouri State University. Publicaffairs.missouristate.edu. Retrieved on 2011-01-14. ↑ "Study Away Programs - Missouri State University". Retrieved 19 September 2014. ↑ About the Hall – Juanita K. Hammons Hall – Missouri State University. Hammonshall.com (2010-11-10). Retrieved on 2011-01-14. ↑ "Darr Agricultural Center enters Phase III – CNAS NewsWatch – Missouri State University". Retrieved 19 September 2014. ↑ "Darr Agricultural Center expansion includes new event facility – CNAS NewsWatch – Missouri State University". Retrieved 19 September 2014. ↑ "Our Promise, The Campaign for Missouri State University". Retrieved 19 September 2014. ↑ "Residence Life and Services – Missouri State University". Retrieved 19 September 2014. ↑ Missouri State University Dining. Missouristate.edu. Retrieved on 2011-01-14. ↑ Dining – Plaster Student Union – Missouri State University. Missouristate.edu (2010-08-26). Retrieved on 2011-01-14. ↑ "Plaster Student Union – Missouri State University". Retrieved 19 September 2014. ↑ "Expressive Activity Policy – Student Conduct – Missouri State University". Retrieved 19 September 2014. ↑ Student Organization's Guide – Office of Student Engagement – Missouri State University. Organizations.missouristate.edu. Retrieved on 2011-01-14. ↑ Inside. KSMU. Retrieved on 2011-01-14. ↑ "OPT – Public Broadcasting for the Ozarks - About OPT". About OPT - About - Ozarks Public TV. Retrieved 19 September 2014. ↑ Sigma Alpha Chi, Latina Sorority. Organizations.missouristate.edu. Retrieved on 2011-01-14. ↑ Xi Omicron Iota – Missouri State University. Xiomicroniota.webs.com (2008-11-20). Retrieved on 2011-01-14. ↑ Bolin, Erin (21 June 2011). "Moats: No Truth To MSU to Conference USA Rumor". Springfield News Leader. Retrieved 26 March 2013. ↑ "CAMS Login - Missouri State University". Retrieved 19 September 2014. ↑ "Inside Higher Ed". Retrieved 19 September 2014. ↑ . Springfield News-Leader, Retrieved on 2012-02-07. ↑ "News-Leader.com - Springfield News-Leader - Springfield news, community, entertainment, yellow pages and classifieds. Serving Springfield, MO". Retrieved 19 September 2014. ↑ "Students discuss new plus/minus grading scale". Retrieved 19 September 2014. ↑ Tobacco Use/Smoking Policy – Policy Library – Missouri State University. Missouristate.edu (2010-09-03). Retrieved on 2011-01-14.